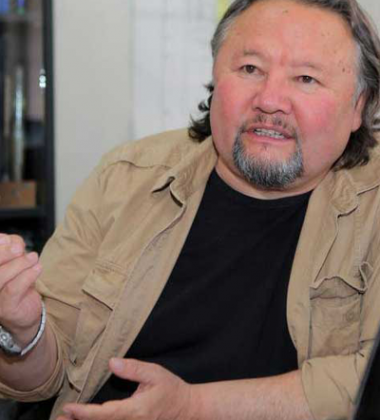 Dr. Tsogtbaatar is one of the most experienced Mongolian field experts, who began his field research and excavation career in the early 1980s. He has personally led many expeditions including the excavation a complete skeletonof Tarbosaurus bataar found in the western Gobi. As a coordinator, Dr. Tsogtbaatar was behind the organization of ground-breaking fossil exhibitions called Mongolian Dinosaurs in over 70 cities in twenty countries in the past 24 years. He is the Mongolian leader of Japan-Mongolia joint expedition, which has made some significant discoveries. His main research area is Ornithopoda dinosaurs including Hadrosauroid or “duck-billed dinosaurs.” Dr. Tsogtbaatar is fluent in English and Russian. Spend this day exploring the sights and sounds of Ulaanbaatar. Visit Gandan Monastery and some of the best museums. 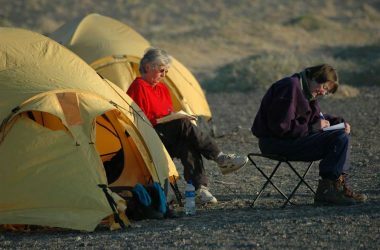 In the morning, fly south east to the Gobi desert and check-in to a 3ger camp. 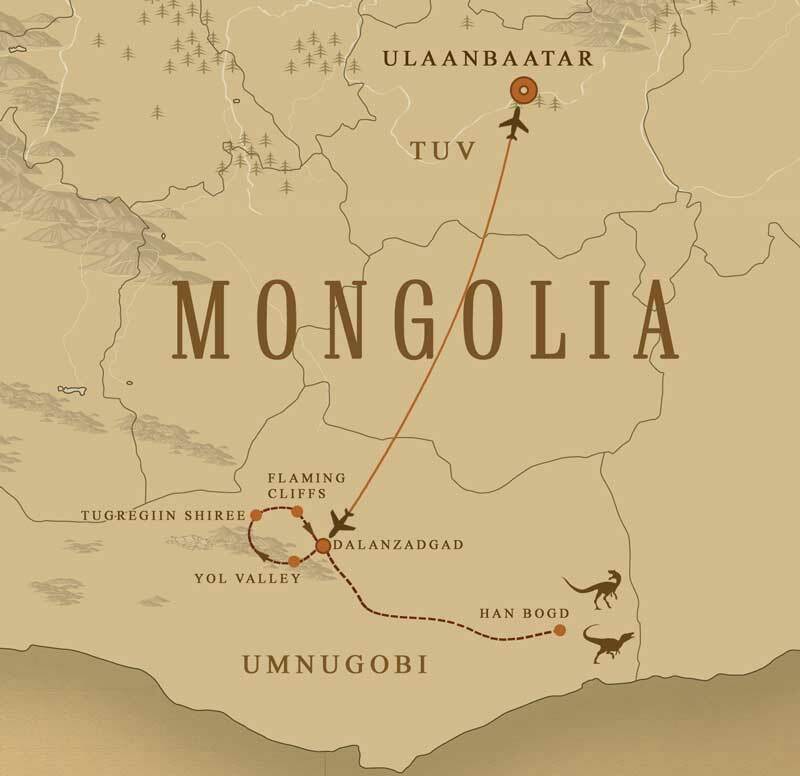 This will be our first taste of Mongolia’s countryside and first day in the Gobi desert. In the next few days, we will be exploring and prospecting at some of Gobi’s richest dinosaur fossil localities, led by Dr. Tsogtbaatar with an opportunity to assist in the excavation of the important finds. We will move our campt site yet again to Shar Tsav. This unique place in the Gobi keeps some of Gobi’s best preserved foot prints of dinosaurs. In the morning, we will drive west to te Gobi Gurvan Saikhan National Park, known as the Three Beautiful Mountains of the Gobi, to explore some of Gobi’s key attraction sites. In the morning, drive to Tugrugiin Shiree, another of the Gobi’s rich localities for dinosaur’ fossil excavations. It was here where the famous fighting dinosaur was discovered in the 1970s during a joint Polish-Mongolian expedition. In the morning, explore the magnificent Yol Valley, named after the birded vulture lammergeyer. In the afternoon, explore the legendary Flaming Cliffs where the first dinosaur eggs the world had ever seen were found. In the morning, we will fly back to Ulaanbaatar and enjoy a last minute shopping and sightseeing. Enjoy a traditional cultural performance in the evening. Farewell and transfer to the airport for departure. 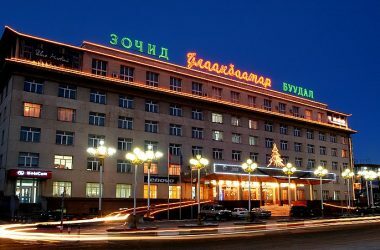 Hotel Ulaanbaatar is conveniently located in downtown Ulaanbaatar and is a well established accommodation with its 20th century characte-ristics and friendly staff. All major attractions of UB are located within walking distance from the hotel. Once we arrive at the fossil localities, we will stay in expedition stye tents. There will be a mass tent for meals and our evening lectures. Sleeping bags and matresses will be provided. In the start and the end part of the Gobi program, we will be staying at cozy and authentic ger camps with western bathroom and restaurant facilities. 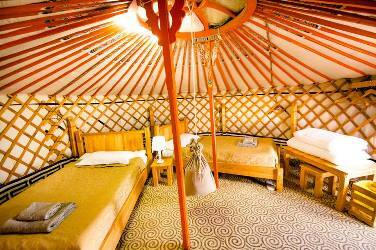 Most visitors find staying in gers as one of the highlights of their trip to Mongolia. 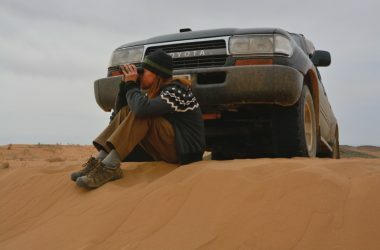 Land transportation is provided by Toyota Land Cruisers, seating up to 3 passangers per vehicle. Some roads can be bumby and hard but our drivers are some of the most experienced and reliable in Mongolia. Separate supply vehicles will be used to carry our tents and kitchen supplies.